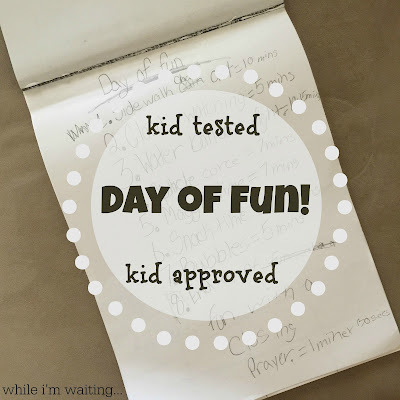 While I'm Waiting...: Day of Fun - Kid Tested, Kid Approved! Day of Fun - Kid Tested, Kid Approved! Last week, Holden came to me super excited! She had a "day of fun" all planned out for us! It was obvious that she had put some thought into this and as I glanced over the list I realized, we could SO do this! After lunch that day, we got busy and had a fabulous afternoon - spending it just the way she wanted. And, you know what?! It was crazy fun!!! So, if there are other mamas out there looking for ways to keep your kiddos entertained, here is a kid tested, kid approved (and 100% planned by a fellow kid) DAY OF FUN! First up: sidewalk chalk art! I noticed she had a water balloon fight listed so we incorporated sidewalk chalk into it. We decided to "surprise" Mike when he got home from work and soak him with water balloons so we chalked the driveway as a warning to him! *I did give Mike a secret head's up about the surprise - didn't want Dad to go crazy on the kids when they drenched him wearing work clothes! :) More about the water balloon fight later! It was Colby's idea to saran wrap the trees! With the shadows it's hard to read but the sidewalk chalk said, "Stop and get ready to get soaked!" They were ready! Too bad they had to wait a few more hours before Dad came home from work! Anything that helps them get along is A-OK in my book! can you see the seahorse?! They worked up an appetite - snack time was next! This is the look of, "Best Sister Ever!" Once snack wrapped up, it was back outside for the obstacle "corse". :) I was a bit worried about this one since I had no clue how to set it up. Well, I didn't need to worry - Holden had it all designed. It was mostly running around things, jumping to touch things, and avoiding Maggie! disregard our yard...I think we should turn it into a beach but my hubs is convinced it will grow grass...one day! Maggie really enjoyed the obstacle course! After the excitement of the obstacle course, Maggie was excited for "Maggie time"! doesn't it look like Maggie is smiling in this pic? 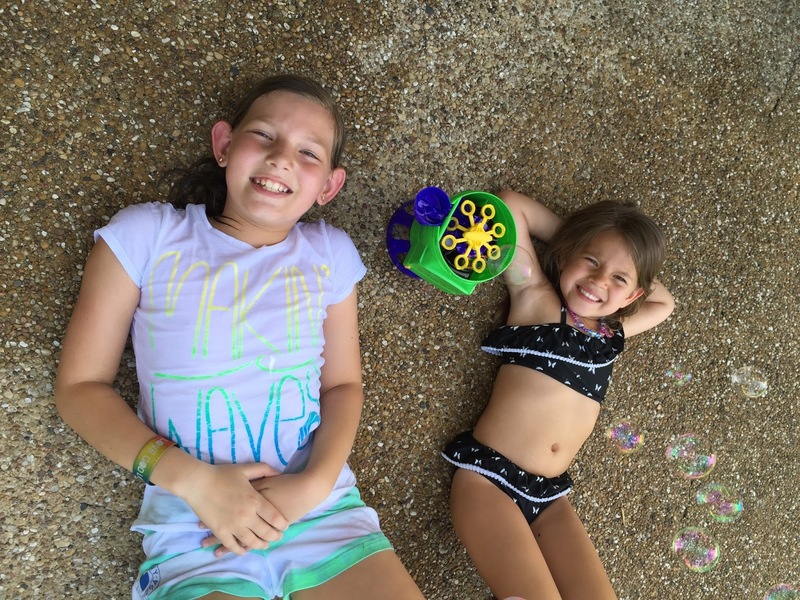 The girls also enjoyed some bubble time before dad arrived home! We then started getting the water balloons ready!!! Yes, I'm a sucker and bought these here. They seems a little pricey but when we were able to blow up 120 water balloons in less than 5 minutes - worth.every.penny!!! And now to the BEST PART of the Day of Fun...the water balloon fight! I can't begin to tell you how much fun this was! the girls were lying in wait! I left a bucket of water balloons at the end of the driveway so that he wouldn't be completely defenseless! oops! Hope got in the line of fire! if you can get a teen to smile this big while hanging out with his family - you count that as a HUGE success! Mike was such a good sport! right until he nearly drenched my "big girl" camera! these next few pics might just be my favorite! Dear Lord, Thank you for today. Thank you for reminding me that joy comes in the small moments spent with family. Please help me find more moments like this. Thank you for blessing me far more than I deserve. In Jesus' name I pray, Amen! I hope you enjoyed a day in the life of my kiddos - done their way. It's a good reminder that we create our own fun. Normal days at home can be boring or a DAY OF FUN! You choose! Have a fabulous day! Gig 'em and God bless! 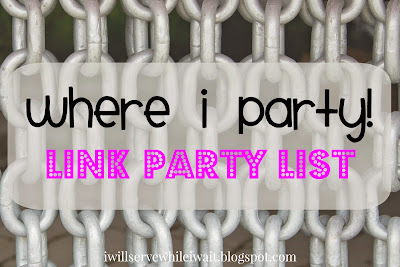 and don't forget about the Waiting on...Wednesday link-up - a place where you can link up what you are waiting on, going through, making, anything - as long as it's family-friendly! :) it's open through Saturday! 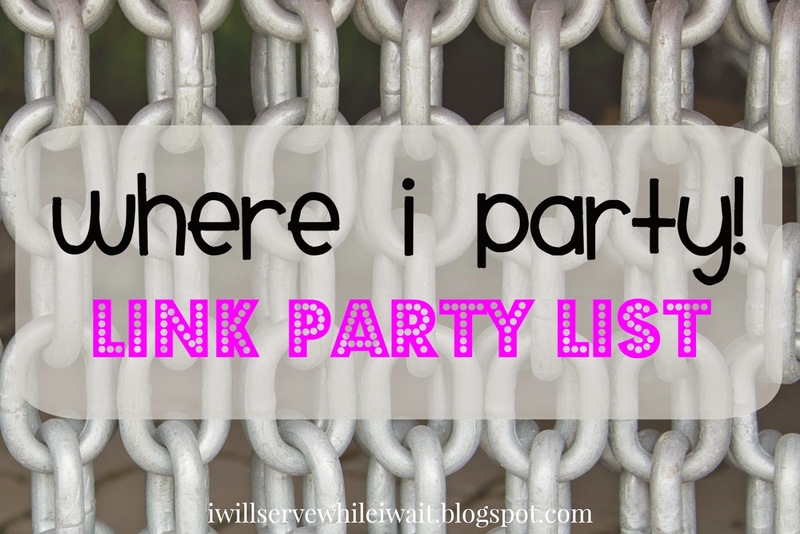 You can check my FAVORITE link-ups page to find where I'm linking up today. 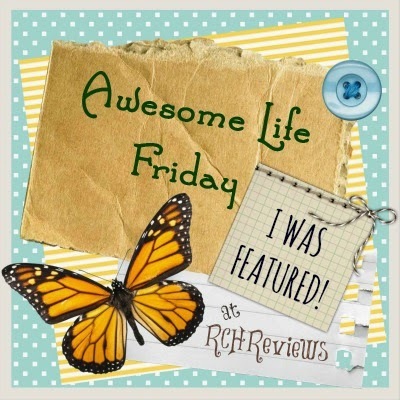 Much appreciation goes out to Lynda from Reviews, Chews & How-To's for featuring our Day of Fun! Thank you so much! This was great Holly. I love her organized, timely schedule, a future teacher in her. What a fun surprise for your hubs and so glad he got in on the action too. What a great memory for everyone. Coolest family! This was so delightful to read. Thanks, Michelle! I was so happy that she took initiative and planned our day! I hope she plans more Days of Fun in the future! What an AWESOME day! And I love that pic of all the kids with Maggie! What a fun afternoon. I adore that she put estimated times by the activities. I think I may have to invest in the water balloon filler. :) My kids have been begging. Have a wonderful day! Sadly, the water balloon thing-y is a one time use contraption (still worth the money in my eyes!). It was loads of fun and I'm super appreciative that I didn't have to plan it! :) I can't wait to see what she plans next time! Can I come be the mom at your house...your kids look way more fun!! haha I love that she had ending with a prayer on her list! Sweet, sweet Holden. Haha - you know my house would drive you crazy! Messes everywhere, no food to eat, teen sleeping the live long day away...but Holden definitely knows how to have fun! By the way, your kids look absolutely darling!! It was a great day, indeed! I was pretty sure Mike would be ok with the water balloon fight - just didn't want to take any chances! No sense it ruining a perfectly good Day of Fun! :) Thanks for stopping by! Have a super day! Thanks! It was a great day! It's easy to forget that it's the simple things they love the most! I'm glad Holden gave me the reminder! What a fun day!! These pics made me smile! have a fabulous weekend! I hope you have a fun weekend too! Thanks for stopping by! Oh, how fun! Water balloon fights should definitely last longer than 10-15 minutes :D Thanks for sharing at Thursday Favorite Things! Haha! They actually do - if you count clean up time! :) Thanks for stopping by! I hope you have a great 4th of July! This is so much fun! I'm totally going to get Radley to plan a day of fun for us and see what happens! Thanks for the great idea, Holden! Thanks, ma'am! I can't wait to see what Radley comes up with! It's fun to see what they think is a Day of Fun - obviously it's much more simple than I like to make it! You have a beautiful family and love the trendy blog, thanks for sharing this on Dream Create and inspire. Thanks for stopping by, Maria! I hope you are having a wonderful weekend! That really is awesome. Just goes to show that it's the simple things that the kids really love....and yes, we can do it! Thanks for stopping by, Catherine! It was an absolute blast! I hope they plan a few more of these days before the end of summer! A couple of things about the water balloon contraption - make sure you get all the air out of the hose before you attach the contraption, fill a bucket with water and then let the balloons fill up in the bucket (otherwise they fall off and bust), and make sure once you fill them up you are ready to use them (the instructions said it's best to use them within 10 minutes). You'll have to share with me what you think about it! You guys have a blast!!! This sounds like TONS of fun! We had a water balloon toss/fight this weekend. I seriously need that water balloon contraption! It was SO much fun!!! And, yes, get one of those contraptions!!! Worth.every.penny!!! What a fun day, Holly! I think Holden may need to become a party/event planner one of these days! 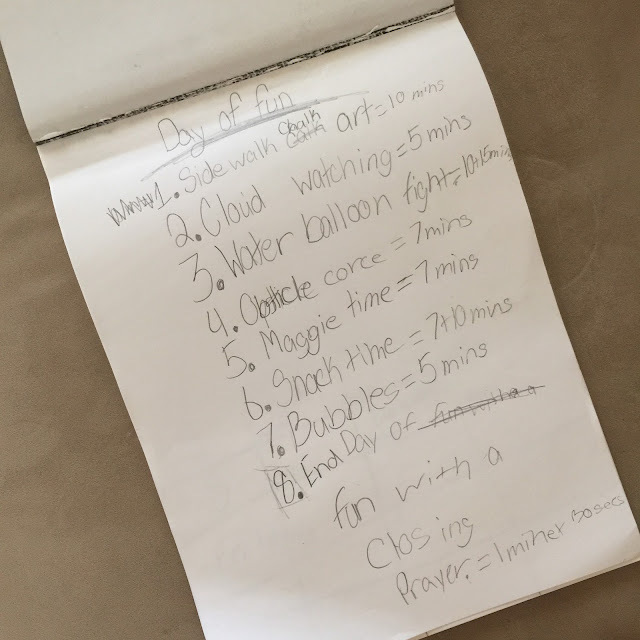 I love her list and the pray - 1 minute, 30 seconds at the end of the day. Wonder if she has been timing the bedtime prayers! Thanks, Melanie! It's fun to see things thought their eyes!!! Thanks for pinning! Have a super day! our family is so precious. I love that they planned the whole day and enjoyed every minute of it! I am always surprised at how little the things are that they enjoy. We always think it has to be some BIG adventure. Great pictures of a fun day!!!! Thank you, Kim! It was to my great surprise when Holden told me all about it! I didn't even have to plant the seed! :) Love days like this!!! He really was such a good sport! And, the kids LOVED it!!! Thank you, Lowanda! We have our good days but we definitely have our share of bad days too! :) Days of Fun seem to make up for those crappy days! Cloud watching is a favorite activity of Holden! She's done it since she was a little girl. Sometimes it takes her really explaining what she sees for me to see it too (and sometimes I never do!). Don't every feel foolish - you've got vision!!! Thank you for stopping by! Now, go enjoy some cloud watching! Have a super day! Thank you so much, Amy! This has been one of my most favorite days of the summer so far! I popped over and loved reading your bucket list! Looks like we have lots of the same ideas! Thank you so much for stopping by! I hope to see you back again! Holly, Thank you for sharing such a special day of fun with us at Brag About It! Love the list of activities, but mostly love the fact that everyone got involved and enjoyed the fun! Thank you for hosting, Laurie! It was such a fun day!